...That's somewhere between New Caledonia and Australia in the South Pacific. but they will maintain a reasonable size when grown in a container in your home. The beauty and symmetry of the plant, as well as the soft flowing texture of the foliage will make you want to decorate it, and use it for your living Christmas tree! Norfolk Island Pines may be grown in most temperature ranges which are suitable for people. However, they will do better when grown in a cool room with day time temperatures of about 65° f. and slightly cooler at night, but never below 50 degrees!. Drafts, extremes in temperature, either hot or cold, and sudden changes in temperatures should be carefully avoided. Norfolk Pines need bright light but never full sun. Preferably you should place your tree within four feet of a large window. Norfolks can survive with only household incandescent or fluorescent lighting if they receive a minimum of 16 hours of light each day. This may be effective in keeping the plant alive for a year or two, but its health will decline. There is no substitute for bright, natural light. 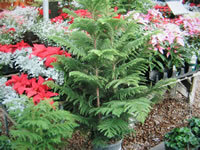 Turn your Norfolk Island Pine frequently to keep it symmetrical. Norfolks should be watered thoroughly every week during the summer to keep the potting mix slightly moist (never soggy!) Water more often if your plant is drying out earlier. During the winter months allow the soil to dry completely before watering again. Preferably, you should use rainwater or water which has set for 24 hours to protect your tree from chemicals. Feed monthly in the summer with a half strength solution of a soluble house plant fertilizer. Lack of sufficient moisture in the air will cause tip browning, needle drop, and eventually, the lower branches to die off. Misting is the best thing you could do for your Norfolk Pine, followed by any other method which would add humidity to the room like a humidifier or aquarium. Norfolk Pines are one of the very few plants who enjoy being misted with COOL water, rather than room temperature water. Do Not Prune Norfolk Island Pines! The only pruning that should ever be done is snipping off brown tips and dead branches. Brown tips will never turn back to green, and unfortunately, once they have turned brown, growth will stop from that point. Any other pruning you may decide to do will have the same effect... no new growth from that point. Norfolks resent replanting, so they should only be repotted every 3-4 years in the spring. Water thoroughly before starting the potting process. Use a fast-draining, sterile, commercial potting soil mix. If you should decide to decorate and use your Norfolk Pine as a living Christmas tree, be sure that the soil is kept sufficiently moist during that time when it is decorated. Electric Lights have a severe drying effect on plants. Be sure to mist your tree daily, or provide other sources of additional humidity. DON'T leave the decorations in place any longer than necessary!